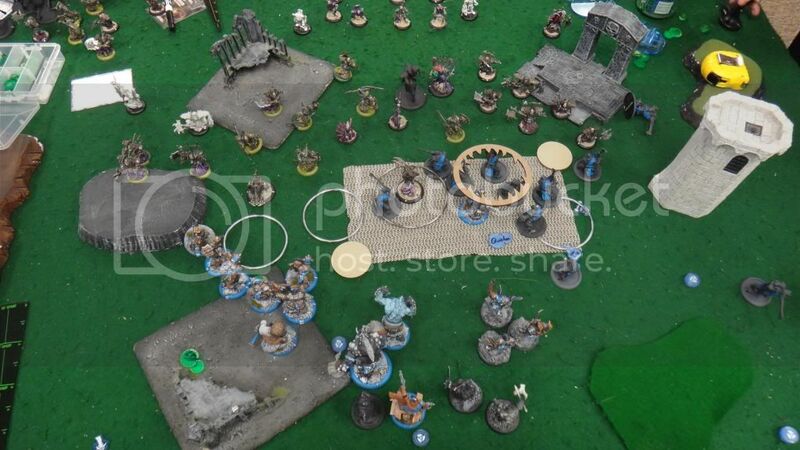 Dice of the First Degree: 50pts Goreshade2 (Cryx) vs. Jarl (Trollbloods). The Rematch. 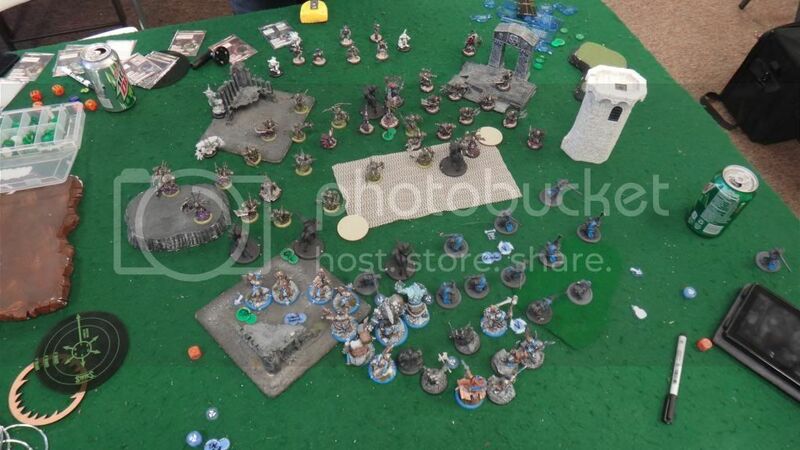 50pts Goreshade2 (Cryx) vs. Jarl (Trollbloods). The Rematch. If you missed the last one, I got my models handed to me by a Goreshade2 tier list that doesn't understand the meaning of dead models. 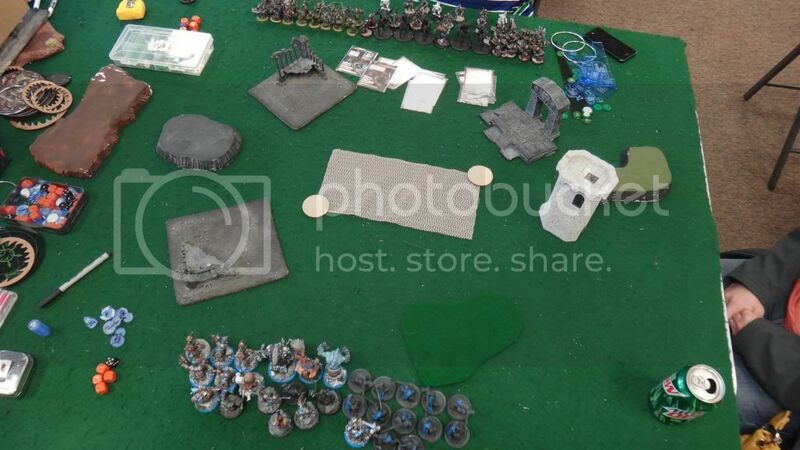 The limits of my opponent are dictated by the number of Bane Thrall models he actually owns. He ran out at one point in the last game. Sanctjud would have been proud. He won the rolloff, deployed first. Then everything ran. Occultation on the Riders. Then my stuff ran. Champions to the left, Fenns spreading out on the right. I decided to try popping feat once stuff was engaged, so held off for a turn. Quicken went on the Fenns for +2 DEF against ranged/magic, and the Champs got Weald Secrets. Impaler Far Striked the Bomber, and the Bomber put some blast damage out there on the Riders, but not enough to kill anything. Then the Riders charged. One tried to get into my Bomber, but failed charge. The Leader got into my Champions, and another failed charge as well. One more ran back. Because he's a chicken. The leader did healthy damage to the Champion he hit, but nothing crazy. Everything else ran, and Sudden Death went on Tartarus, Curse of Shadows landed on the Champions, and I think the Bomber got Death Chilled by the Pistol Wraiths, while one shot a Fenn, giving me Vengeance. Fenns Vengeance up, put some damage on the rider, but nothing more. The Kithkar, however, Vengeances and finishes him. Jarl drops Weald Secrets, upkeeps Quicken. The Kithkar activates again, and charges the Bane rider on the right. This triggers Sudden Death from Tartarus, who charges into the Kithkar, and rolls double ones to miss. Haha. The Kithkar then kills the Cavalry between his two attacks, and the Fenns charge with a Warcry from the Fell Caller. I try to get one up between Tartarus and the Kithkar to within reach of the rider waaaaay in the back, but I can't make it happen, and he fails charge. The rest of the Fenns charge into Bane Knights/Thralls, including 2 into Tartarus. For the most part, the Fenns murder their thralls, but leave Tartarus on one box, and with perfect thresher targets as he sits. The Champions charge, and kill the two riders on the left, and with Overtake and the extra attack, creep forward and smack a couple more. The Bomber puts some AOEs in the backfield, but only kills one or two. Stormtroll kills 2 more Thralls. 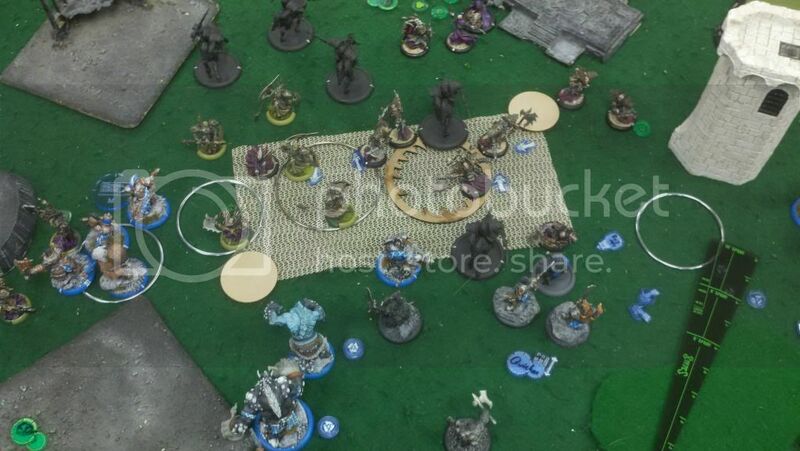 Jarl moves up, magic bullets and tries to kill the last Bane rider in the backfield, but just doesn't have range on anything that's not stealthed (Bloody occultation). So he takes a shot at something else and feats, dropping clouds on all the melee stuff. Which does me 0 good against Cryx, mind you, since the debuff is only -2 to hit for Living Models. None of Cryx are apparently alive. But on the plus side, my dice, for the most part, are doing good work. The Bomber is killing things, stuff's going ok. Sons of Bragg run, and the Chronicler gives the Fenns Hero's Tragedy. Aaaand it's feat turn for Goreshade. He drops Occulation. 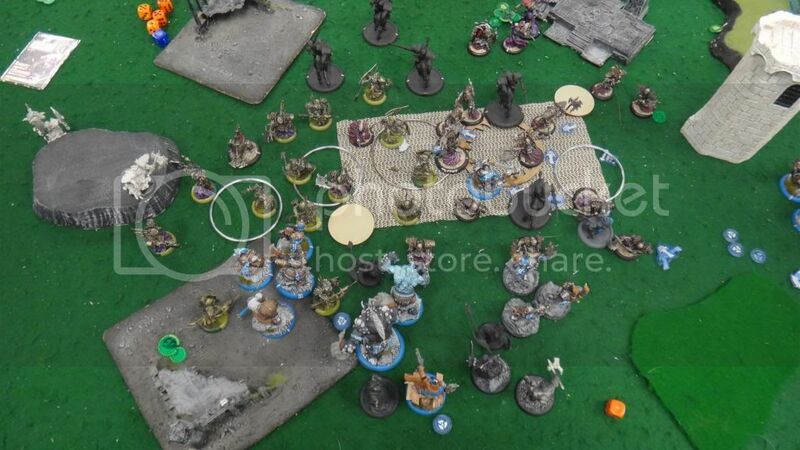 Tartarus opens the ball with a Thresher that kills 3 fenns, misses one, and misses the Kithkar. Pops three Banes and adds them to the nearby unit. 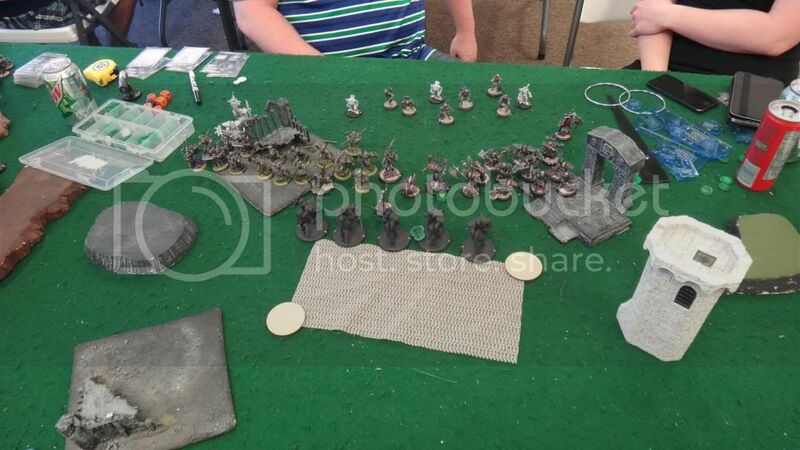 Goreshade feats and brings back 4 riders and 5 thralls. He then drifts away, his work here being done. Thralls charge, kill off all of the Fenns, the Kithkar still somehow being alive. 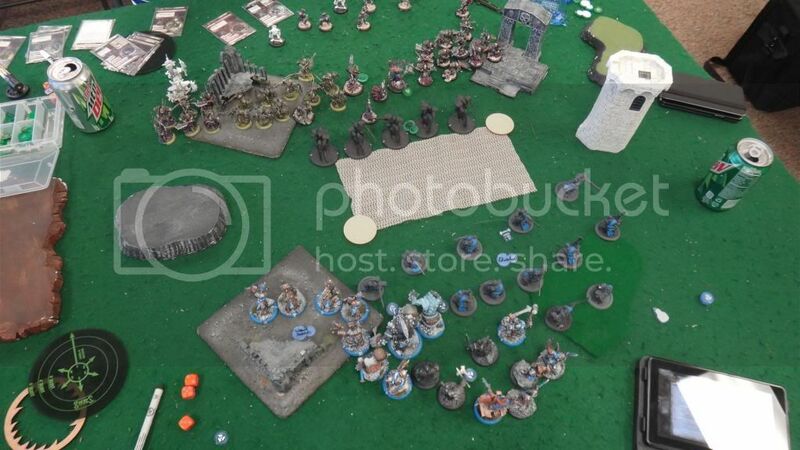 Thralls on the left charge, and kill two Champions. Pistol Wraiths death Chill the Bomber again. What's left of the Knights tangles with the Stormtroll, and one gets all the way into the Chronicler, but he toughs, and a Rider engages Tor, son of Bragg, while the rest fill in behind Thralls. So, the Champions move in and start killing things. Each one hits, each one moves an inch with Overtake, and hits another one. Champions are doing work again this game. Champion hero plows through them, and threshers what's left. Kithkar stands up, and whacks a few thralls. I should have whacked the Bane rider, but I didn't. Tor backs up since he's engaged by the Bane rider, (not the thrall, which is toughed at the moment), and dies to the Free strike. Wrathar and Rhudd do some work, but I really needed Tor's spray, and couldn't make it work. Bomber kills a few things, Stormtroll shoots the leaps do some more work, but at this point, I'm grasping at straws, and don't have a way to contest this zone very well. In fact, I think at this point in the game, one of the Riders had killed my objective (it's been a week ago since this game happened lol). Jarl finishes Tartarus though, and shoots another thrall down. Knights and thralls push in, kill a few more models like Rhudd and another champion, but my tough rolls are hanging in there, and making life difficult. However, he does manage to score 2 CP, on top of the 1 he already has. My beasts are alive at the moment (though there is damage out there), but I don't have any good ways to contest the zone, and with Occultation down on Goreshade, I can't even see him. The Game store is closing in 5 minutes, so we let it go and call it game. I gaurantee I got some of that wrong. It's been a week and I've played a few games since then. I'm about to invest in a notebook and just start doing shorthand notes as the game goes. Make things considerably simpler. 1. Bomber was great. Much better than the Wagon. I don't think he made his points back (Not that it matters, because everything could have made points back, and he just kept creating them), but he removed some key models. There was one blast damage that cranked it and killed Bane rider even. I still don't know that he was the best model for this game, (Rok may have been better), but I liked him a lot more than the War Wagon. 2. Jarl. I like Jarl, I really do, but dealing with this much stealth (Thralls, Occultation) makes it really difficult to do what he wants to do. He can try to remove key units all day long, but either he can't see them or anyone within 5'', or Goreshade feats them back. I wouldn't drop Jarl against Cryx, which makes him difficult to take in a 2 list format if my other list won't handle cryx either (Probably Madrak2). 3. The key point of that game, I think, was Tartarus and the Kithkar duking it out in the middle. When Tartarus countercharged, he blocked the charge lane that I had to the last Bane rider, and killing the Bane rider was pretty instrumental in shutting down some of this list, I thought. ARM18 with boxes is tanky for that list, while everything else, I can generally kill with AOEs and stuff. 5 of them is a pain, 9 of them with the feat is ridiculous. I had a charge lane to the last one, and Tartarus blocked it. And then Tartarus wouldn't die. Either I couldn't hit him, or I couldn't roll damage. But, to my opponent's credit, he did it at the perfect moment. If Tartarus had countercharged the fenn I planned to send at the last rider, I'd of magic bulleted the rider off of Tartarus. After that, I just didn't have a way to reach him. Grim1 would have aimed and shot him off the board, but Jarl with neither True Sight, Mage Sight, or a Magic Bullet target, couldn't do it. After that, I struggled to get back in the lead attrition wise. The Champions did great, but for 15 pts, I was only getting 11 attacks, whereas with the Long Riders, I'd get the charge, impacts, and could slam Fenns all over the board. Idk if that would have been the right option, but it would be worth a shot. Overall though, I wanted to try Jarl in the bad matchup again, and make sure I actually do hate the War Wagon, which I do. I'm curious if Madrak2 would handle this matchup better, and I feel like he would, simply because of the number of attacks he can dish out on his feat. But I think Grim1 will be my next shot, for kicks and giggles. I don't know that Madrak2 could handle most of the Cryx matchups, whereas Grim1 would be more suited for it I think. Idk. But I really enoyed the game, learned a lot from it and am looking forwards to the next one. I have 3 batreps coming yet. 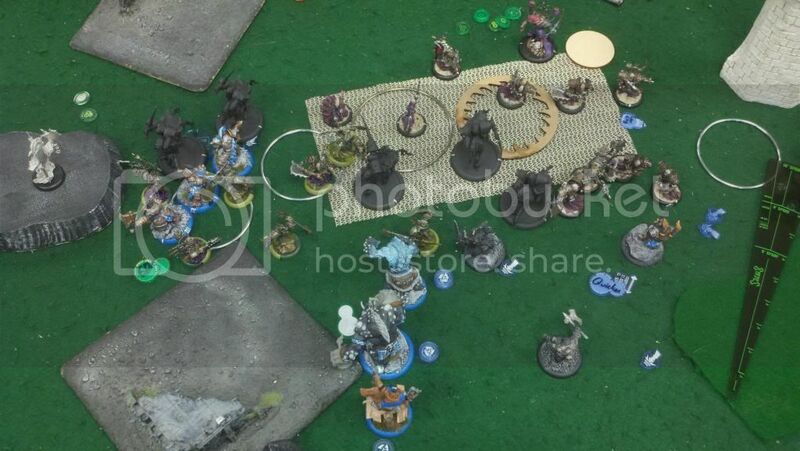 Grim1 vs. Bethayne, Madrak2 vs Harkevich, and Jarl vs. Issyria. We'll see how it all goes.